The Eddie Bauer – 1/4-Zip Fleece Pullover Style EB202 is available in Adult Sizes: XS-4XL and can be purchased in your choice of the following colors: Black, Grey Steel and River Blue. The Eddie Bauer 1/4 Zip Fleece Pullover can be purchased in your choice of the following colors: Black, Grey Steel and River Blue. A Contrast rolled top collar, zippered chest pocket, reverse coil contrast zipper, open cuffs and an open hem. Contrast Eddie Bauer logo embroidered on right chest. 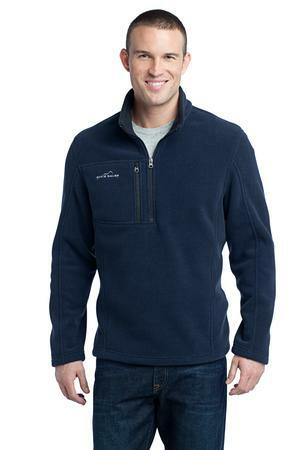 Made of 12-ounce, 100% polyester fleece which incorporates Low Impact Technology™ for enhanced softness and performance. Be the first to review “Eddie Bauer – 1/4-Zip Fleece Pullover Style EB202” Click here to cancel reply.